LA MIRADA >> A sheriff’s patrol car responding to a report of a collision became involved in an collision of its own on Wednesday afternoon, officials said. The crash occurred about 5:20 p.m. at Imperial Highway and La Mirada Boulevard, Los Angeles County sheriff’s Sgt. Manuel Flores said. 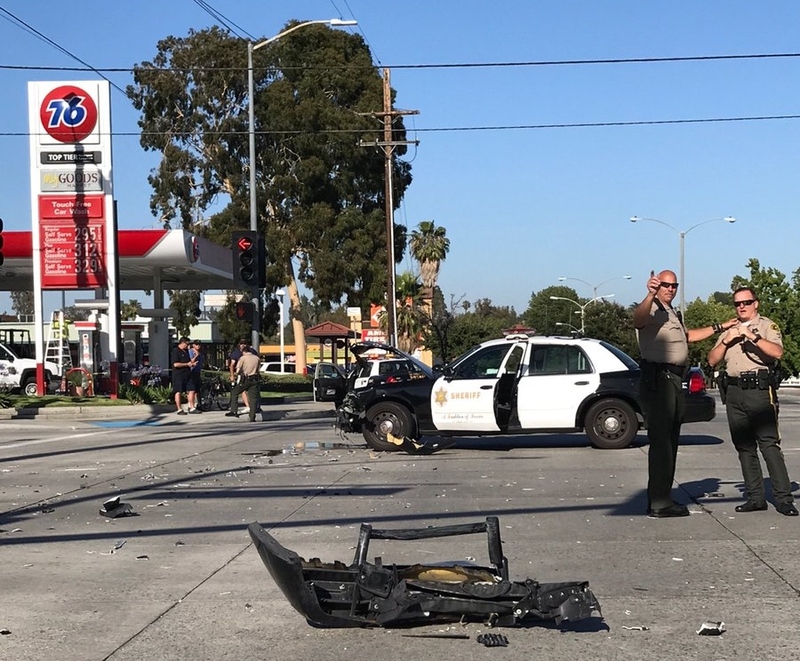 The deputy was heading north on La Mirada Boulevard with emergency lights and sirens activated when the patrol car collided with another motorist driving through the intersection on Imperial Highway, the sergeant said. The deputy was responding to another reported car crash when the collision took place. Officials said the deputy suffered injuries to his chest and ankle, possibly amounting to fractures, but suffered no apparent major injuries, Flores said. A passenger in the second car involved in the collision complained of pain but declined to be taken to a hospital, he said. The driver of the second car was apparently unhurt. 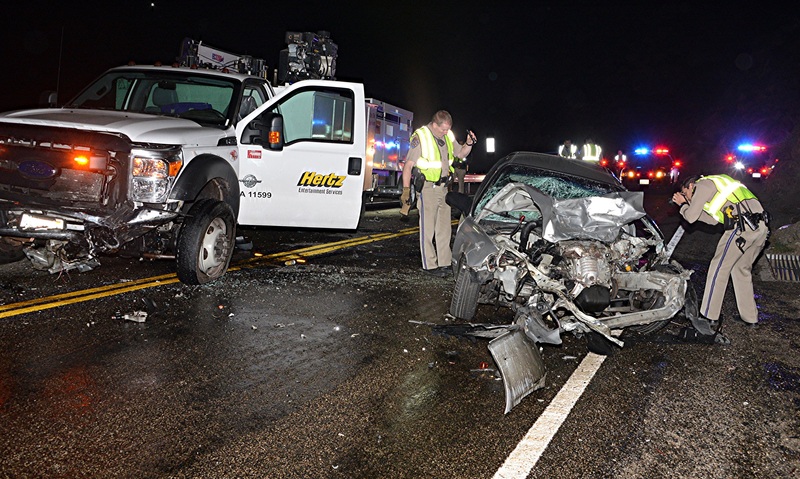 WHITTIER >> A mother driving with her son died after two suspected street racers lost control and crashed along Colima Road in Whittier, sending one of the speeding vehicles slamming into the woman’s car on Friday night, authorities said. Police arrested Corey James Kiefer, 22, of Whittier, and Jacob Zamora, 22, of Anaheim on suspicion of gross vehicular manslaughter following the 8:40 p.m. crash in the 7700 block of Colima Road, just north of Mar Vista Street, according to Whittier police officials and Los Angeles County booking records. “It appears as though the individuals arrested were street racing,” Lt. Bryan Ellis said. The identity of the woman who died in the collision was not released Saturday pending positive identification and notification of her family, Los Angeles County Department of Medical Examiner-Coroner Lt. David Smith said. She was initially described as a woman estimated to be in her 40s. Investigators believe the fatal crash resulted from an illegal street race between a white Hyundai and a black BMW, which were both traveling at “a high rate of speed,” police said in a written statement. Kiefer, who was driving the BMW, suffered no injuries in the crash and was arrested at the scene, officials said. Zamora, who was driving the Hyundai, as well as a passenger, were taken to a hospital to be treated for minor injuries, officials said. Zamora was later arrested in connection with the deadly crash. Authorities were yet to determine whether DUI played a role in the collision. According to county booking records, Kiefer was released from jail Saturday morning pending his initial court appearance after posting $50,000 bail. Zamora remained in custody in lieu of $50,000 bail pending his arraignment hearing. Anyone with information on the crash can reach Whittier police at 562-567-9200. Tips may also be submitted anonymously to L.A. Regional Crime Stoppers at 800-222-8477. ANGELES NATIONAL FOREST >> A man died in a head-on collision between a Honda Civic and a pickup truck on a winding stretch of Angeles Crest Highway deep in the Angeles National Forest north of La Canada Flintridge late Thursday, officials said. The crash took place about 8:45 p.m. at mile marker 27.28, California Highway Patrol officials said. Investigators had not yet identified the man killed in the crash, Los Angeles County Department of Medical Examiner-Coroner Assistant Chief of Operations Ed Winter said. He was estimated to be in his 20s. “(The Honda) was traveling southbound on Angeles Crest Highway through a turn, then lost control and traveled head-on into (the pickup truck),” CHP Officer J. Saunders said in a written statement. Paramedics pronounced the driver of the Honda dead at the scene. A 59-year-old Lancaster man who was driving the pickup truck, a Ford F-550, was treated for minor injuries, Saunders said. The cause of thee crash remained under investigation. Anyone with information can reach the CHP’s Altadena-area office at 626-296-8100. MONTEREY PARK >> A woman died and two men clung to life in critical condition after an SUV veered off the roadway and struck them as they were walking on a Monterey Park sidewalk on Friday morning, authorities said. The collision took place about 8 a.m. on Garfield Avenue at Avondale Avenue, Monterey Park police Lt. Gus Jimenez said. The woman and two men were walking on the sidewalk along the east side of the street when the small SUV heading north on Garfield Avenue suddenly veered to the right, according to the lieutenant. “The vehicle went up onto the curb and struck the three pedestrians,” he said. Paramedics pronounced the woman who was struck dead at the scene, Los Angeles County Department of Medical Examiner-Coroner Assistant Chief of Operations Ed Winter said. She was yet to be identified. The two men who were also struck by the SUV were taken to Los Angeles County-USC Medical Center, where they remained listed in critical condition Friday afternoon. The driver of the SUV, a woman described as a senior citizen, was also taken to a hospital for treatment of an apparent medical issue, Monterey Park police and fire officials said. After striking the pedestrians, the SUV struck two other cars before coming to a rest in the intersection, Jimenez said. No significant injuries were reported from those vehicles. The cause of the crash remained under investigation, Jimenez said. The SUV driver was cooperating with police. Officials shut down Garfield Avenue well into the afternoon. Any witnesses, or anyone with information, can reach Monterey Park police at 626-573-1311. PASADENA >> An El Monte man early Thursday after a crash between his compact car and a big rig along Colorado Boulevard in Old Pasadena, authorities said. The crash took place about 4:50 a.m. at Colorado Boulevard and Pasadena Avenue, Pasadena police Lt. Pete Hettema said. Coroner’s officials withheld the man’s identity Thursday pending notification of his family. Police described him as a 53-year-old El Monte resident. He was driving a 2008 Toyota Prius north along Pasadena Avenue when the car collided with the trailer of a big rig that was heading east on Colorado Boulevard , the lieutenant said. Pasadena Fire Department firefighters freed the Prius driver from the wreckage and took him to an area hospital, where he succumbed to his injuries, Hettema said. The driver of the big rig was unhurt, he said. It initially appeared one of the vehicles ran a red light at the intersection, however it was unclear which one. The cause of the crash remained under investigation by the Pasadena Police Department’s Traffic Section. Any witnesses, or anyone with information can reach Pasadena police at 626-744-4241. SOUTH WHITTIER >> A 10-year-old boy died after being struck by a car while riding a scooter in the unincorporated county area of South Whittier on Friday afternoon, authorities said. Eduardo Jara of Whittier succumbed to his injuries at a hospital, Los Angeles County Department of Medical Examiner-Coroner Investigator Mario Saenz said. The collision was first reported about 4:45 p.m. on Sunshine Avenue, just east of Painter Avenue, California Highway Patrol officials said in a written statement. An 18-year-old Whittier man was heading east on Sunshine Avenue at about 15 mph in a 1996 Ford Mustang, officials said. Jara, who was not wearing a helmet, suffered major injuries, CHP officials said. He was flown to Los Angeles County-USC Medical Center by helicopter for treatment. CHP officials were notified about 8 p.m. that the boy had succumbed to his injuries, Officer Stefan Brandt said. Authorities said the driver of the Ford remained at the scene and cooperated with investigators. The incident is under investigation by the CHP’s Santa Fe Springs-area office. Any witnesses, or anyone with information, can reach the office during normal business hours at 562-868-0503. IRWINDALE >> A crash between a motorcycle and a car in Irwindale early Sunday claimed the lives of both the motorcyclist and the driver of the car, authorities said. The crash took place about 12:30 a.m. in the 14900 block of Los Angeles Street, east of Maine Avenue, Irwindale police Sgt. Rudy Gatto said in a written statement. 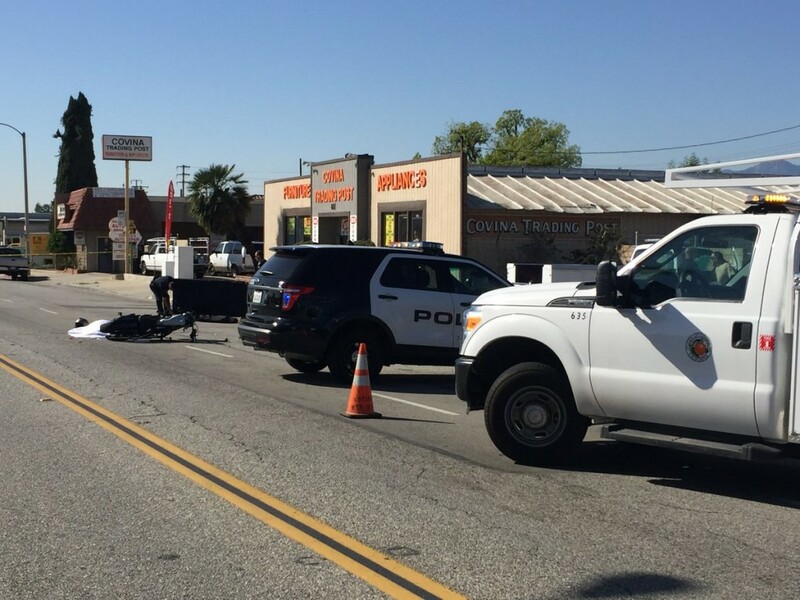 “Irwindale Police Department officers responded to the scene and found that a motorcyclist had been traveling eastbound in the No. 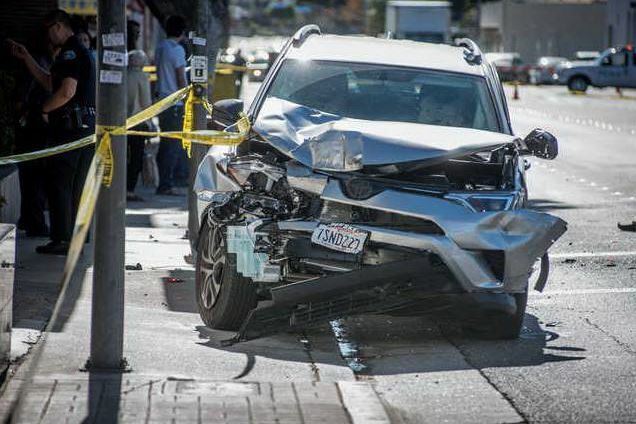 1 lane of Los Angeles Street when it collided with a white Toyota Scion that had been making a left turn out of the parking lot of a nearby business,” Gatto said. The motorcycle collided with the driver-side door of the Scion as the car was exiting the parking lot of AMVETS post 113 and turning onto westbound Los Angeles Street, Sgt. John Fraijo said. Paramedics pronounced the both the motorcyclist and the driver of the Scion dead at the scene, Fraijo said. The motorcyclist was identified as Erick Medin Del Rio, 22, of Baldwin Park, Los Angeles County Department of Medical Examiner-Coroner Investigator A. Lopez said. Officials identified the driver of the Scion as 38-year-old Oscar Pena of Ontario. A woman riding as a passenger in the Scion was taken to a trauma center for treatment, according to the sergeant. An update on her condition was not available. Gatto said the cause of the crash remained under investigation. Any witnesses, or anyone with information, is urged to contact the Irwindale Police Department Detective Bureau at 626-430-2245. LA HABRA >> A woman died in a two-car crash that left another woman and two children injured late Friday, police said. The fatal collision took place about 9:50 p.m. at Harbor Boulevard and Arbolita Street, La Habra police officials said in a written statement. “Officers arrived and located a traffic collision involving two vehicles,” according to the statement. “Two adult females from one vehicle and two children from the second vehicle were injured. All four injured people were taken to hospitals, where one of the women ultimately succumbed to her injuries, authorities said. Her identity was not released Saturday. Further details regarding the circumstances of the crash were not available. Anyone with information is asked to contact the La Habra Police Department Traffic Unit at 562-383-4300. COVINA >> A 21-year-old Covina man died Thursday after his motorcycle collided with a Covina Department of Public Works pickup truck, authorities said. The crash took place at 2:04 p.m. on San Bernardino Road at Prospero Drive, Covina police Sgt. Gregg Peterson said. Paramedics pronounced the motorcyclist dead at the scene, he said. His name was not available. California Highway Patrol officers were summoned to handle the investigation to avoid any perceived conflict of interest, since the fatal collision involved a city-owned truck and city employee, Peterson explained. The motorcyclist was heading east on San Bernardino Road at an “undetermined speed” in the left-hand lane on a 2011 Harley-Davidson Sportster just prior to the crash, CHP Officer Rodrigo Jimenez said. A 2014 Ford F-250 truck being driven by a 54-year-old Covina man and city employee was heading north on Prospero Drive, approaching San Bernardino Road, at 5 to 10 miles per hour, Jimenez said in a written statement. The cause of the crash remained under investigation, though intoxicated driving did not initially appear to be a factor, Jimenez said. The driver of the truck was unhurt and cooperated with investigators, Peterson said. Officials shut down both directions of San Bernardino Road between Grand and Barranca Avenues for several hours as they carried out their investigation Thursday afternoon.